MyGate My-Enterprise: My Enterprise is a process method that uses web services to transmit the transaction to MyGate. The merchant would host their own payment page and clients don't leave your website ensuring less cart abandonment. 2. MyGate Virtual: My Virtual is a processing method that utilizes the MyGate hosted payment page. 3. MyGate Tokenization and debitization: The functionality allows a website to post through a transaction value to be debited, frequency of debit and for what period in which the credit card is to be debited. Make it easier for your customers to pay you on new orders and renewals. The MyGate + WHMCS module is the answer to automatically get paid when payment is due and reduce delinquency rates. Get paid as soon as funds become available. We help you to apply for a merchant account and take the hassle out the dealing with banks. We also can help you to extend your current merchant facilities to include acceptance of web payments. 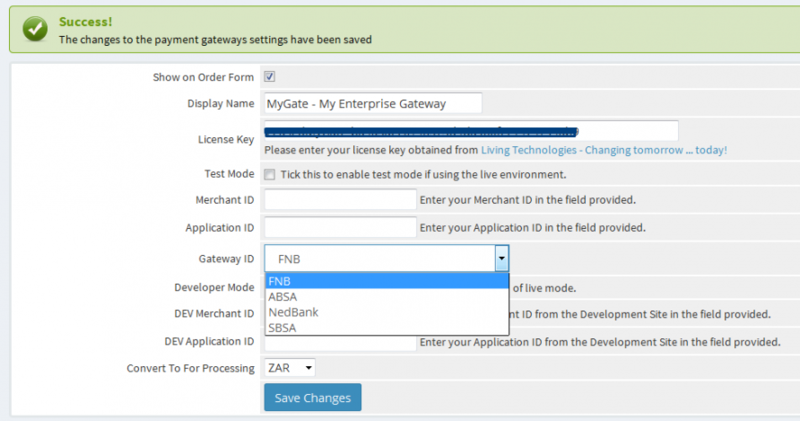 it is very easy to integrate the MyGate Payment Gateway. Click on the "Buy NOW" button. You will be directed to Instant Web WHMCS to purchase the module. We will assist you in installing the module. Thank you for your kind words Mandla. I just want to add to say that this development was for Ubuntu environment.